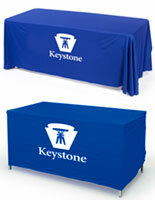 Wholesale Table Skirt Company Sells Discounted Tablecloths for Trade Show and Banquet Centers! This Table Throw is in Stock Now! 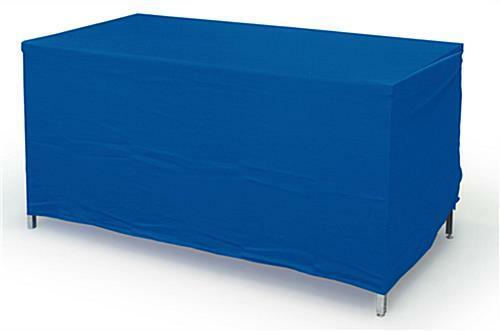 This adjustable table skirt is fabricated of royal blue premium polyester and is machine washable, wrinkle and flame resistant. 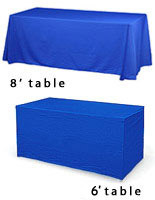 Documentation certifying the flame resistant property of the tablecloth (by an independent testing laboratory) is provided with each table skirt purchased. 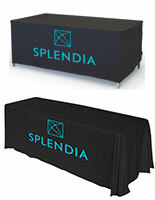 This table throw provides a professional look to every tabletop presentation whether displayed at a trade show, job fair, banquet hall, or convention center. 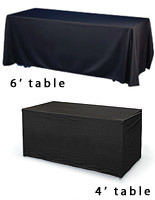 The inexpensive table skirt for sale is perfectly sized for smaller venues as it fits both 6' and 4' standard tables. 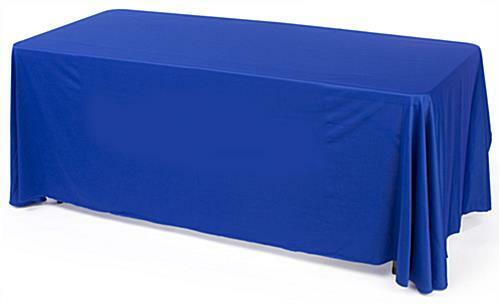 This royal blue adjustable table skirt is essentially two tablecloths in one and ensures your table skirt will fit the tables being supplied by a conference decorator. 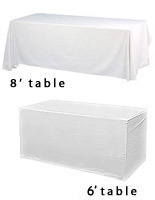 The adjustable tablecloth, also called a table skirt or throw, covers a 6' table from top to the floor in an elegant draping manner. The 4' tables are also covered from top to floor but have a more fitted appearance. The fitted appearance is achieved when the fabric is folded to adjust for the smaller size of the table. Each table skirt features sewn-on hook-and-loop tabs that allow for the effortless conversion from a 6' throw to a 4' throw. 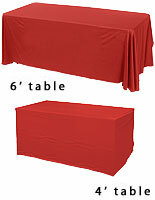 Drapes Over Tables: 6' x 30" x 30"
Converts to Fit Tables: 4' x 30" x 30"